Our community shined tonight, raising over $320 for sustainable relief efforts in Puerto Rico. Thank you to everyone who participated! It got heated. It was passionate. Thoughts and opinions flew. Information, ideas and experiences were shared. It was a true community dialogue. Tonight, Raíces Cultural Center’s Eco-Culture program presented a slideshow and facilitated a discussion on Sustainable Disaster Relief. We focused on the example of what is currently happening in Puerto Rico post-hurricane María, because the island is so near and dear to our hearts and we have such a strong connection to the island with family, friends and collaborators living there. This was the first in a new lecture series organized by OQ Coffee Co. in Highland Park, NJ, and we made sure to start out their series with a bang! One of the big takeaways from the dialogue is that we have to be sure to think about the social and political history of the island when reflecting on the current situation there, and that when speaking about sustainability we must include not only environmental and ecological sustainability, but also economic, emotional, mental, cultural and spiritual sustainability. Raíces would like to thank all who attended the program, added their voice to the mix and made a donation to our PR Sustainable Relief Fund. 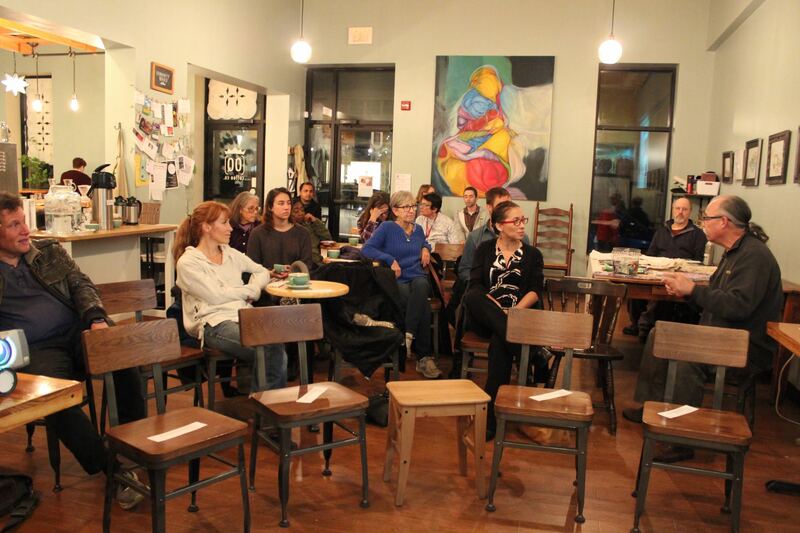 An extra special thank you goes out to OQ Coffee’s Charlotte Taylor who invited us to share and dialogue with the community and to OQ itself for offering its space as a place to have this dialogue, as well as sharing some delicious coffee and snacks. We also want to thank all who could not attend, but shared event information in their networks and helped to spread the word. During tonight’s discussion, not only did participants’ emotions emerge, but so did their generosity. Thanks to all who participated and gave, we raised a total of $322 to add to our PR Sustainable Relief Fund. This brings our total funds raised for this effort to $620 of our $1,000 goal! 100% of these funds will be donated directly to Casa Pueblo for their grassroots, on the ground, frontline, sustainable relief efforts in Puerto Rico, when we make our own relief work journey there in January 2018. Thank you to all who have helped us move towards our goal! Couldn’t make it tonight, but still want to donate to help us reach our goal? You can give through our Paypal or Network for Good accounts and designate the donation for “Casa Pueblo”. We will send you a donation letter and update you on total funds raised before we leave for Puerto Rico this January. Our community shined at this presentation, raising over $320 for sustainable relief efforts in Puerto Rico. Thank you to everyone who participated! Raíces Eco-Culture Coordinator Nicole Wines presented a slideshow on sustainable relief efforts in Puerto Rico.